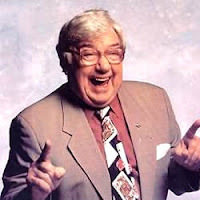 Belfast-born comedian Frank Carson has today joined the UK Independence Party. Mr Carson, who now lives in Blackpool, said he took the decision because he was "disgusted with the way politics has gone". "We need to get out of the EU and ditch the human rights legislation," he said. "I'm fed up with all the other political parties and think it's time for a change, and so do many others." Party chairman Paul Nuttall said he was delighted that Mr Carson had joined the UKIP. "He is an excellent comedian, but he has a very serious point," he said. Lets hope Frank will take a whistle stop tour to help the cause. I've already emailed his agent, inviting him to Swindon.